We are a valet parking company specializing in valet and parking business which has built its reputations in the quality, courtesy and honesty for over 20 years. We provide our Valet Parking Services for Events, Weddings, Birthdays, Restaurants or any kind of event where parking attendants are needed. Established in 1999. Our founder started working for major parking companies in Los Angeles Metro area. What began as a personal dream was extended to be a family Business and then became what we are today, A&A Parking Services is quickly becoming an industry leader throughout Southern California for Valet and Parking Service . A&A Parking Services posses the experience, knowledge and resources to ensure the most success of your special event whether its a small private party at home or a corporate event for a 1000 or more guests. Valet parking at special events, most of the time, is a necessity Please consider what we offer you when you hire A&A Parking services: • Greeting and welcoming customers with a smile • Controlling the flow of traffic to eliminate congestion • Keeping the work area clean and free of debris • Holding umbrellas during inclement weather • Complete friendly Parking Attendant service • Attendants well uniformed, Experienced and supervised • Full Liability Insurance & Garage Keeper's • Our great experience in business working for you Remember that Valet Parking service is your event’s first and last impression. 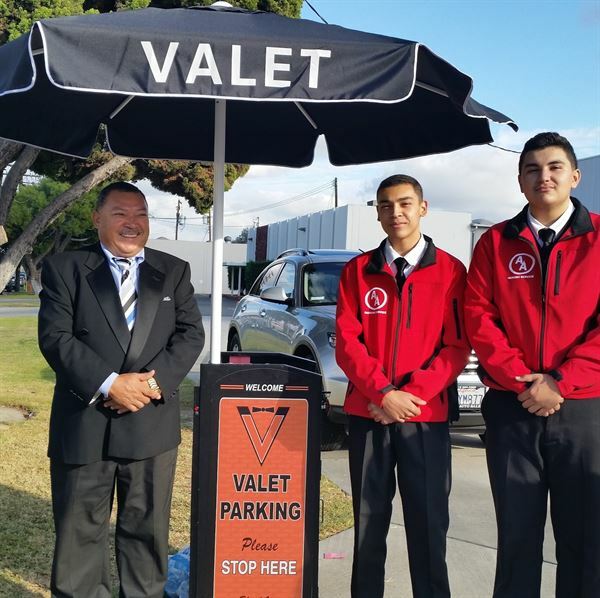 At A&A Valet and Parking service our parking attendants and management crew are always eager to assist you and help in any way for the success of your event. Would you like to try a new Valet service for your Business? We take the risk with you, making a deep examination of costs and keeping them at the lowest level. Our professional and courteous team members are specially trained at Southern California's Luxury Private Events, Restaurants, Corporations, Mansions, and Charities ensuring that the lasting impressions instilled are memorable and nothing less than 5-Star. FOR INQUIRIES REGARDING OUR SERVICES: RESERVATIONS: www.valet-parking-services.com/quote Website: www.valet-parking-services.com/ Available for Restaurants, Weddings, Private events, Bar Mitzvahs,Quinceañeras, Birthdays, Memorials, Promos, Graduations, Seminars, Baby showers, Real estate Office, Gyms, Office Building, Banquet Halls, Shopping Centers, Hotels, Retail Centers, Beauty Salons, Garages, Parking Lots, Health Net, Hospitals, Studios, Movies, Clubs, Country Clubs, etc.